Trend alert: families are heading up into the sky to experience adventure. Sure I like the beach, but I also love to get the kids moving and want them to get out in nature. That&apos;s why I loved our recent trip to Ramblewild adventure park in Lanesborough Massachusetts. Ramblewild delivers thrills and family bonding in a scenic Berkshire setting. Sure, theme parks have their place, and I love a good family hike. But combining the thrills of a roller coaster with the physicality of a country ramble? I&apos;m sold! Not long ago, my brother told me to check out the GoApe parks. They looked cool. 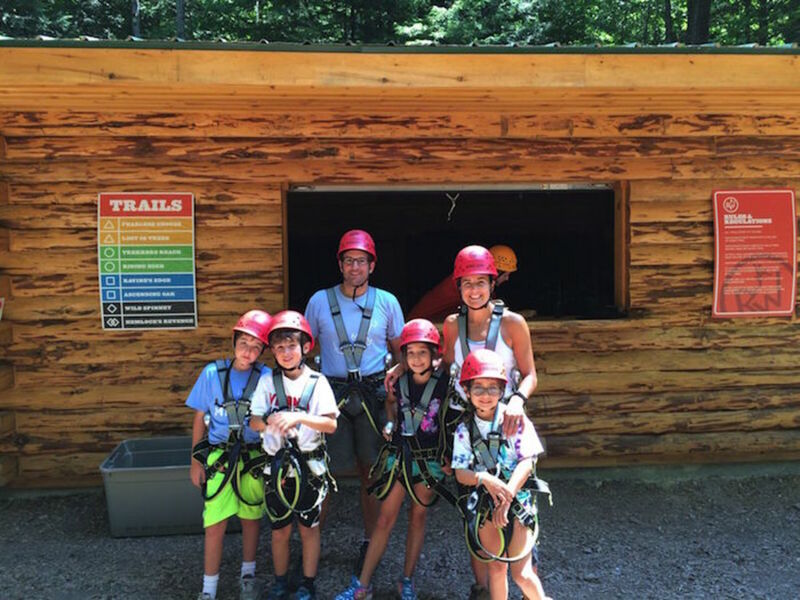 Since my girls were already hooked on the joys of zip-lining, I thought I&apos;d explore the trend. I&apos;m going to make an official trend alert: zip-lining is taking off! The Ramblewild experience is not my first time at the aerial park rodeo. Our family has been up in the trees in Malaysia and Nicaragua as well as a winter zip-lining session in Montana. Our girls love tossing on the harnesses and connecting carabiners in the name of fun. Our latest adventure was to Lanesborough Mass. to Ramblewild. And it was out biggest, baddest adventure to date. First, a planning alert: BE SURE TO CHECK THE HEIGHT OF YOUR KIDS! The self-guided courses are made for kids and adults +55" and ages 7 and up! Our little one (age 7) just squeaked by the height cut off. It would have been devastating to drive all the way there to be turned away or have one kid sit out. After a short hike from the check-in desk, you&apos;ll be outfitted with a harness and helmet. Everyone starts off with a full safety briefing. Your crew will move on to a practice course that&apos;s barely off the ground. It&apos;s the perfect place to master the art of the carabiner under the watchful eye of a Ramblewild instructor. I found all the staff to be friendly, competent and very enthusiastic. Our crew was a mixed group in personalities from let&apos;s go "fast and high" daredevils to those who wanted to see the safety testing documents before climbing onto the platform. Practice is a good idea. It takes some skill for little hands to master the click and unclick. But they got it and we were ready to move on, er, I mean up. 45&apos; to be exact. There are eight courses in all. They vary in difficulty and are very well marked. We decided to split up. I took the most junior adventurer and my brother ventured off with the three braver souls. Though the park is 10 acres, we were never very far apart and were able to check in at the "base camp" and water station. There are five levels of courses. Everyone starts on yellow beginner courses. And there&apos;s nothing boring about them. 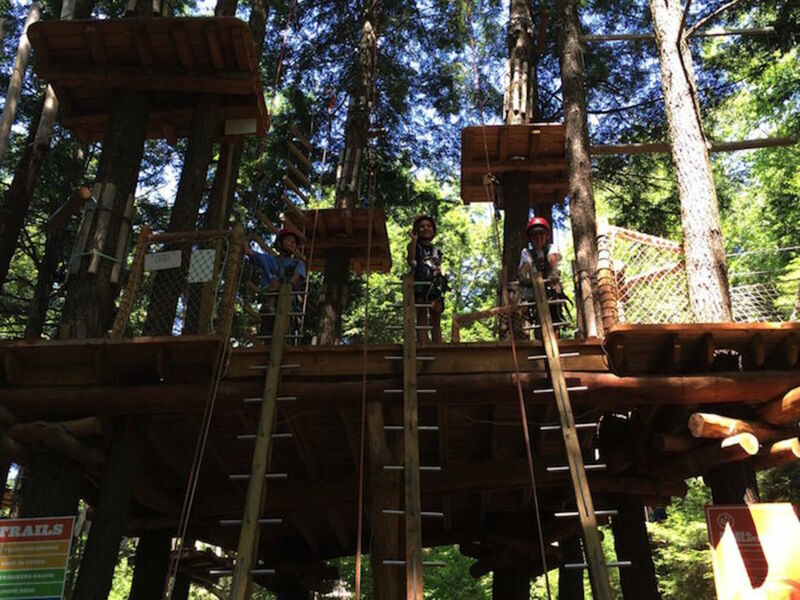 The "Fearless Grouse" has balance challenges, climbing, and yes, zip-lining. All safe. All awesome. Next we moved on the the longer "Lost in the Trees" it was tougher, but still manageable. From there the challenges get bigger. The highest difficulty ranking (double black diamond) goes to a course called "Hemlock’s Revenge" --I&apos;m saving that challenge for the next trip. All in, we found the construction to be sturdy, creative and seamlessly blended into the trees. What to bring: There&apos;s water provided and no great threat of sunburn. What to wear: Wear comfortable clothes. The harnesses are very snug against; best to avoid baggy clothing. TIP: remember close-toed shoes. I forgot mine and the manager loaned me a pair of hiking boots! Time Management: We spent about 3 hours at the facility. It takes about 40 for kids to do a course--and it&apos;s a lot of exertion. Keep an eye on hydration and energy levels. Ground breaks are a good idea. Who will enjoy this: Kids who like a bit of adventure. One of our crew is more trepidatious than the others. The beginner routes (the yellow ones) provide a hearty challenge without inducing panic. I admit to overstepping the boundaries with my 7 year old. When we saw long lines developing (a Hasidic school from Brooklyn descended on the facility at the end of our visit and the line for the yellows got really long), I moved the two of us over to from the beginner (yellow) to the intermediate (green). She wasn&apos;t ready for the challenge. It&apos;s a fine line. While you want your kids to push themselves and take some calculated risks, you also want them to have fun. On the last course of the day, we really weren&apos;t having fun. Mom&apos;s fault. Know your kids&apos; limits and respect them. 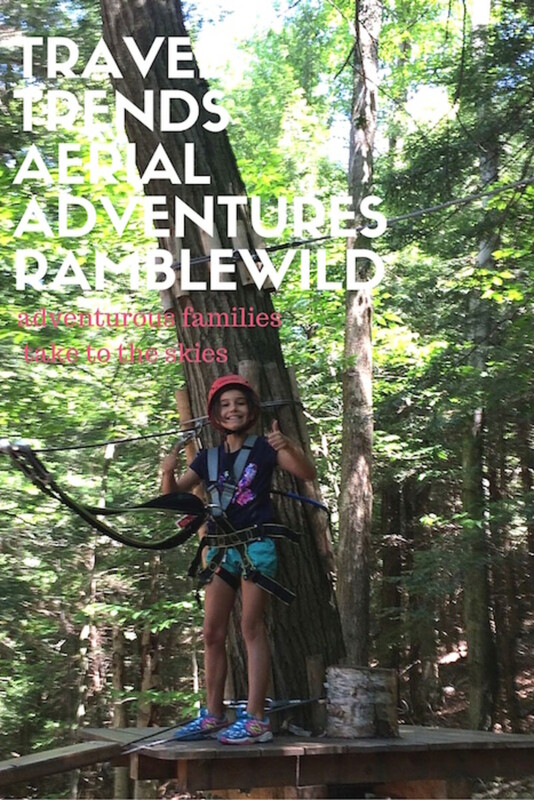 Ramblewild is the perfect activity for a long holiday weekend. If you&apos;re in the Berkshires, you can also visit the newly renovated Clark Art Museum (to balance adventure and culture) or nearby Mass MoCa. I suggest Papa Charlie&apos;s sandwich shop in nearby Williamstown after your session for a humongous sandwich to refuel. This not a sponsored post. Half of the family got free passes.